The tree featured today is Larix decidua ‘Pendula’ – an excellent accent tree to grow in for year round interest. Larix decidua ‘Pendula’ or Weeping European larch, as is known commonly, offers many interesting features: soft, fresh green, needle like foliage that turns into golden yellow in autumn, interesting sculptural branch structure in winter when it sheds its foliage, and attractive, exfoliating, and nicely textured bark on the trunk. Spring is the best time of the year to appreciate the beauty of this lovely tree. It is the time when nice green foliage covers pendulous branches of the tree. The pendulous branches of Larix decidua ‘Pendula’ form a nice mound of foliage in cascading fashion. Autumn changes the color of delicate foliage from green to golden yellow making the tree stand out from its neighbors. Larix decidua ‘Pendula’ grows slowly but eventually makes a nice accent tree. The best time to plant it is spring or fall. Young plants can be started in containers but they would eventually need to be transferred into the ground. The best place to plant Larix decidua ‘Pendula’ in a garden is a sunny spot in a well-drained soil. The tree does not require frequent watering and should be irrigated only when the soil has dried completely. 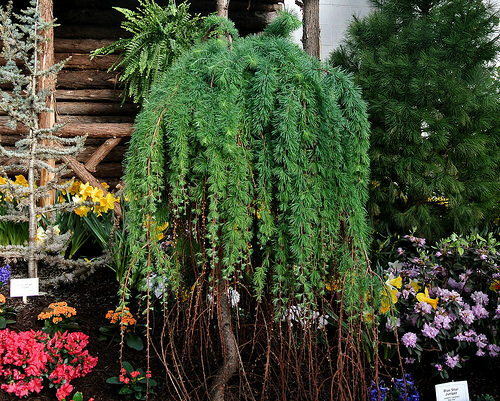 A mature tree of Larix decidua ‘Pendula’ can grow up to 12 feet in height. If you like Larix decidua ‘Pendula’, you should also consider Taxodium distichum ‘Cascade Falls’.